It is common in sports to relate a location or facility to the sport itself. Yankee Stadium? Sure, that’s baseball. The Rose Bowl? Football. But it is extremely rare—and special— when a sport can be likened to the venue itself. When somebody says golf, the Old Course of St. Andrews is often the first thing people think of. Tennis—Wimbledon certainly springs to mind. Even non-tennis players and non-golfers would know the significance of each. These historic venues have influenced the very culture and success of each sport over hundreds of years. For tennis fans, watching a match on Centre Court at the All England Club is usually at the top of the bucket list. It is the oldest tennis tournament in the world. The players must adhere to the all-white dress code policy that has been in place since the 19th century. Matches are almost certainly to be accompanied with Royal patronage and other celebrities in the Royal box. Enjoy strawberries and cream while taking in the elegant nature of grass court tennis. Many of the sport’s most recognizable players have made their name at Wimbledon. Borg, McEnroe, Navratilova, Evert, Sampras, Graf, Williams, Federer and Nadal are just a handful of the legends that enjoyed success at tennis’ most prestigious major. The fans at Wimbledon are calm, smart and appreciative, a tennis viewing experience unlike any other. And for passionate golf fans, could there be any greater honor than teeing off on the first hole at St. Andrews? Commonly referred to as ‘The Home of Golf’ or ‘The Cathedral of Golf’, St. Andrews, Scotland is a destination that takes your breath away. More than a few have imagined playing on the same hallowed grounds as Bobby Jones, Sam Snead, Jack Nicklaus and Tiger Woods; 29 times has the Old Course has hosted The Open Championship. From the iconic Swilcan Bridge, the large double-greens, the deep pot bunkers to the R&A Clubhouse in the background as you come down the 18th, the Old Course feels familiar even if you’ve never set foot. For the first time, Tennis and Golf enthusiasts can experience both historic pillars of sport with the trip of a lifetime in Summer 2019. Offered by Cliff Drysdale Tennis and Troon in partnership with Keith Prowse, official hospitality provider for The Championships, Wimbledon, the experience is scheduled for June 30-July 7, and virtually defines “the best of both worlds”. Kick off the trip in London at the five star Mayfair Hotel, where you’ll already begin to feel a strong sense of iconic elegance. After a night’s rest, you’ll be ready for Day 1 of the Championships, which features a whole plethora of intriguing matches. The following day you’ll make you presence known on Centre Court, the most historic stadium in tennis. With opening day seats, you’re guaranteed to see living legends compete each day. While in SW19, you’ll have another extremely unique opportunity; a meet and greet with Tennis Hall of Famer Cliff Drysdale. Get insight into the tournament from a former player and current commentator; Drysdale has been coming to Wimbledon since the 1960s and will tell you some incredible stories! Next up is a quick flight to Edinburgh, Scotland and shuttle to the 5 star Old Course Hotel at St. Andrews. After you’re checked in, you’ll need to get warmed up for your first round of the week at the Castle Course. Opened in 2008 and designed by David McLay Kidd, the course is the newest of seven courses in St. Andrews. Overlooking the renowned 17th hole Thursday night, you’ll be eager to get out the next morning for your tee time on the immaculate links of the Old Course. The sense of exhilaration you will feel while playing never dissipates as you stride along fairways so often trodden by golfing greats, past and present. And your golf experience doesn’t end there; play the top ranked Kingsbarns Golf Links on Saturday. Enjoy stunning views of the sea and meander through the dunes as you hopefully go low on your last round of the trip. What makes this experience so unique is the first class service and hospitality provided along the way. From full English and Scottish breakfasts to afternoon tea and group dinners, your trip will be equal parts breathtaking and relaxing. Share this once in a lifetime trip with loved ones and friends; the perfect escape from the heat of summer in the U.S.
Of course, opportunities like these are not a dime a dozen. The package is in high demand, and to ensure a spot you’ll need to get your name down as soon as possible. 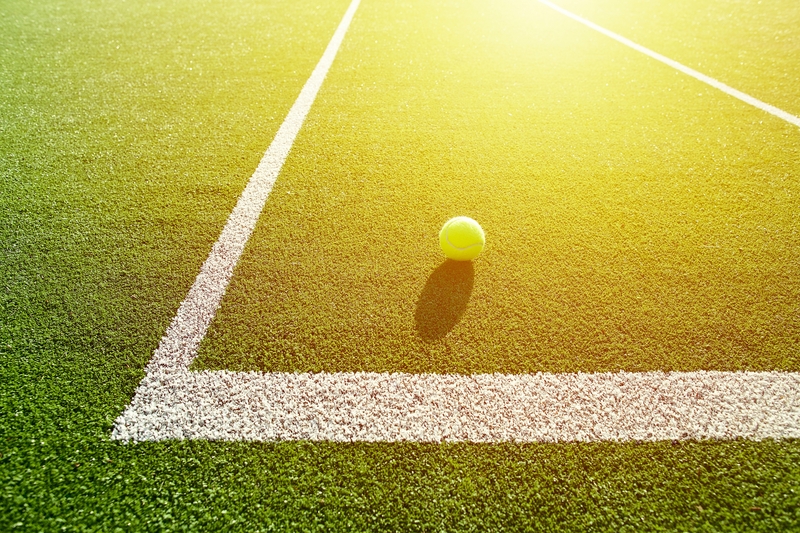 Make this tennis and golf dream a reality by inquiring today. Contact Katie Steck at k.steck@cliffdrysdale.com or call 830.625.5911 ext. 208 for more information.